Are you ready for the ulti­mate Tra­bant expe­ri­ence? Get behind the steer­ing wheel of the leg­endary Tra­bant P601 and explore Germany’s most beau­ti­ful areas. Expect scenic stop-offs, excit­ing chal­lenges and dri­ving skills exer­cis­es. The tasks can only be achieved through team­work and will assure you the stage vic­to­ry. This is our very own demand­ing dri­ving skills course. It’s about the per­fect inter­ac­tion between dri­ver and co-dri­ver. Whether it is dri­ving a zigzag course blind­fold­ed, rolling tyres or revers­ing the Tra­bant: col­lab­o­ra­tive skills, ambi­tion and instincts are indis­pens­able! Our all-round care­free pack­age! Hire our Tra­bants for your own event. 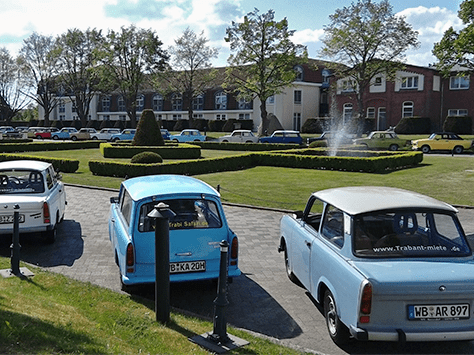 We take care of logis­tics and pro­vide the cars Ger­many-wide. Our expert staff will give all nec­es­sary instruc­tions to all par­tic­i­pants. They will func­tion as a ser­vice team through­out the entire event. The Tra­bant P601 is the most icon­ic cult object of the for­mer GDR! 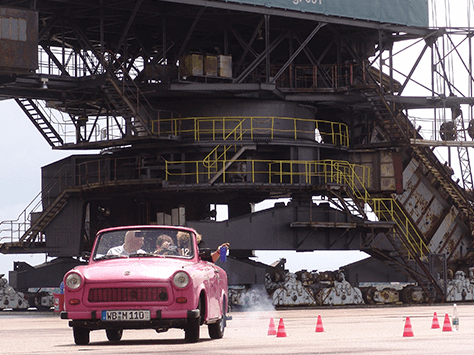 Although the last car rolled off the assem­bly line in Zwick­au, Ger­many, in 1990 you can still hire the Tra­bant from the Event & Tour­ing AG for your pur­pos­es. You expe­ri­ence trav­el­ing through the past and the fas­ci­nat­ed atten­tion of oth­er road users is upon you! We are your per­fect part­ner in hir­ing Tra­bants in Ger­many. 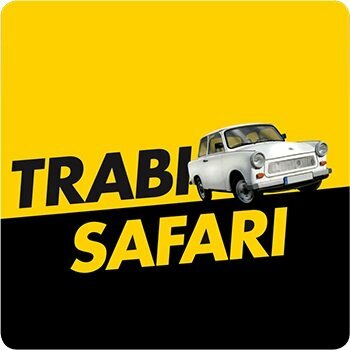 Whether it’s rent­ing a Tra­bant for your upcom­ing event, expe­ri­enc­ing our Tra­bi Safari or to suc­cess­ful­ly com­plete our Tra­bi Abi: look no fur­ther – you have found the right part­ner in us! For over 20 years we have guar­an­teed all our clients a smooth run­ning of its events and we are doing our best to achieve our cus­tomers’ require­ments and wish­es. 357.168 km² Ger­many and we will come to you. We are oper­a­tional Ger­many-wide with our Tra­bi-Truck!